Is Compassion Important In Zen? At first glance, it might seem like compassion isn’t important in Zen. There’s a whole lot of emphasis on insight and concentration practices. It’s true that in the Zen tradition there is a lot of focus on the mystical experience, cultivating insight to try to attain Enlightenment. Texts like the Diamond Sutra and the Heart Sutra do spend a whole lot more time talking about non-duality than they do about compassion. But I’d argue this is a slight misunderstanding. The truth is that compassion is fundamental to every branch of Buddhism. The story of the Buddha tells us that he sat under a tree and attained Enlightenment. At first he thought he couldn’t possibly teach it, because Awakening requires an intuitive understanding and he knew that any explanation would be difficult to express. But he decided to try anyway. He was motivated by compassion. In that story we have the two most important aspects of Buddhism, in my opinion. They are great insight and great compassion. 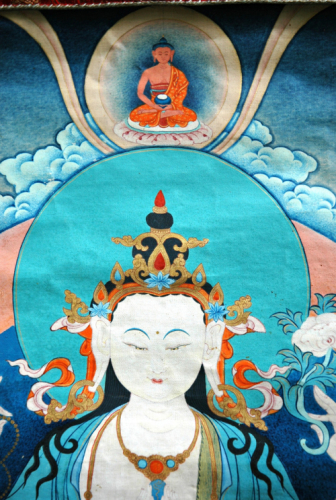 Attaining Enlightenment, striving to Awaken and helping others to do the same IS compassion. If I can become more mindful and aware, I am making the world a better place. When I save myself from the effects of my delusion, I am saving others from the effects of my delusion too. Additionally, I should mention the vows. One might have difficulty finding a lot of compassion in sutras and teachings of Zen masters. But the vows we take in the Zen tradition are clearly motivated by compassion. Here are the four great vows. Sentient beings are numerous. I vow to save them. Defilements are endless. I vow to eliminate them. Buddha’s teachings are unlimited. I vow to learn them. The ways of enlightenment are supreme. I vow to achieve them. We can see right there that the first one is all about helping others. I don’t think it’s an accident that that is the first of the four vows. Additionally, we have the Bodhisattva Vows, which are all about making sure we are as harmonious as possible in our interactions with others. Generosity, Virtue, Patience, Diligence, Concentration, and Wisdom. Those first three are pretty clearly motivated by compassion, by a desire to engage the world in a way that is positive and helpful, rather than harmful. At its core Zen is about transcending duality. It’s about tearing down the false barriers that separate us from others. If we engage duality compassion naturally results. So, in this way, compassion is always fundamental to the path.